Please click the "Stockist Registration" link at the bottom of the page in order to obtain an account for purchasing products. I’d like to introduce to you ‘My Squeeze’! A reusable food pouch / squeezie for babies and young children that can be filled with any squeezable snack of your choice! Recommended for children 6 months and older, My Squeeze is a great option for homemade baby food when you are out and about with your little one. With day cares and schools moving towards healthy and waste free lunchboxes, My Squeeze helps parents cut out the waste from the prepackaged ‘squeezies’ and also cut down on food costs. Not only do parents know exactly what their little one is eating but the varieties are endless. Suitable for homemade baby food, yogurt, custard, jelly, fruit slushies, smoothies and more! My Squeeze can be frozen to keep cool for parents out and about with their child or just as a refreshing treat for their lunchbox throughout the day. What is the recommended age for using My Squeeze? The age is dependent on your child and is the time that you start to introduce your little one to pureed foods. 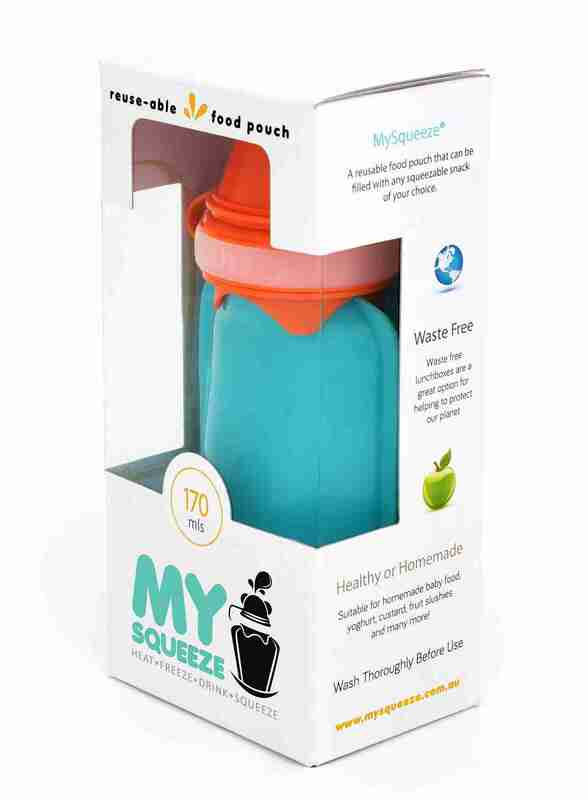 It is great to use as a vessel for puree food and will allow them to transition from breast/ bottle to self-feeding from the My Squeeze pouch. What do I put in My Squeeze? 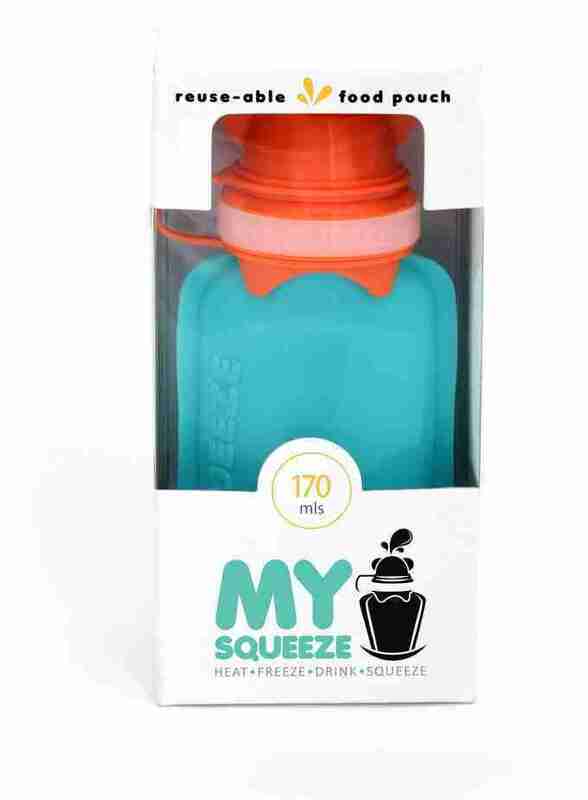 The My Squeeze food pouch is great for puree, yoghurt, custard and smoothies. Take a look at our social media for ideas and creations. How do I clean the My Squeeze pouch? The pouch is top rack dishwasher safe or hand wash with a bottle brush and warm soapy water. The inside of the pouch is rounded so no food will get caught in any corners. The spout is open with all parts accessible. 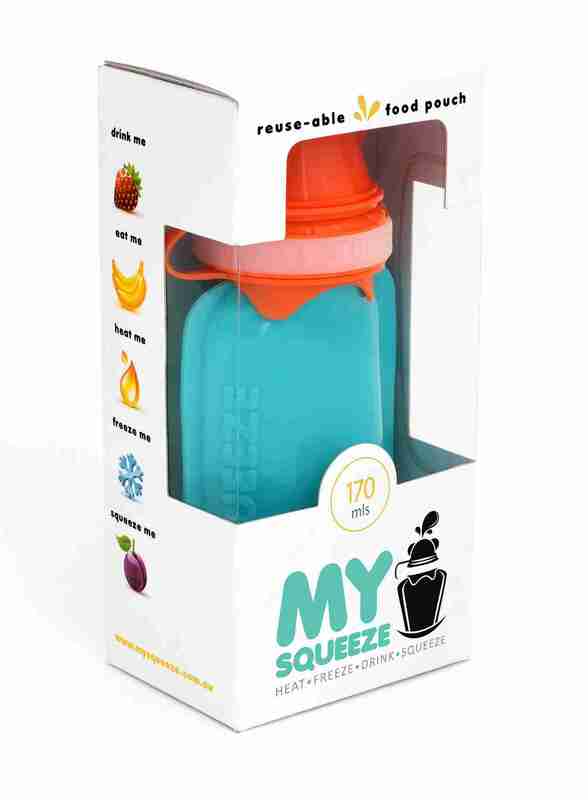 You can also clean the My Squeeze pouch in baby bottle sterlizers. The pouch has been tested for melting point at 220 degrees. What is My Squeeze Specifications? Can I freeze the My Squeeze food pouch? Yes! Freezing the My Squeeze food pouch is an excellent way to store food to be eaten later in the day. Great for school lunch as it will keep the lunch box cool or for family outings. Please note we do not recommend you freeze the pouch for an extended period of time. Can I microwave the My Squeeze food pouch? Yes! Perfect for warming up puree’s. Place the pouch into the microwave with the lid off to allow steam to escape. Always ensure you test the temperature before giving to your little ones.